Right, so when I last left off, I had just escaped Guglovo with quite a lot of blood lost, and had reached the outskirts of Novoy Sobor. Due to the loss of blood, Hugos vision wasn’t the best, he was now seeing in black and white. 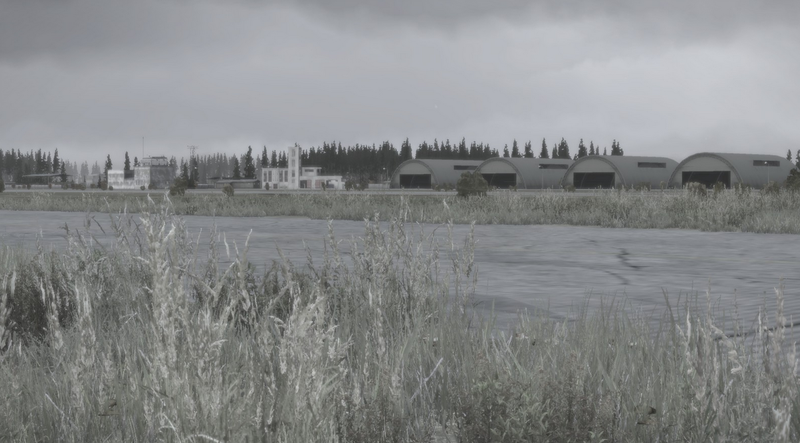 In the DayZ mod, Novoy Sobor and more so Stary Sobor were considered pretty dangerous places, due to them usually having a high amount of loot, and being close to the NW airfield. One thing was for sure, there were a lot more zombies. As I still had no good weapon, (screw you spade), I had to take things cautiously as to not get caught out. I didn’t spend too long in Novoy Sobor, but managed to stock up a little more on supplies, and found myself a satchel type back pack, which is one on the smaller packs with 12 slots. Oh I also found 3 sewing kits, random… As my hoodie was a bit damaged I decided to fix it up with the sewing kit. It didn’t make a lot of difference. But it’s good to know they actually have a use. Many items are still pretty useless at the moment, but these are the types of things that you will see updated in the coming months. On to Stary Sobor! I headed around the outskirts, scouting the area, looking out for zombies and other people. It looked pretty clear, so I crept in to some nearby barns on the SW side of the town. 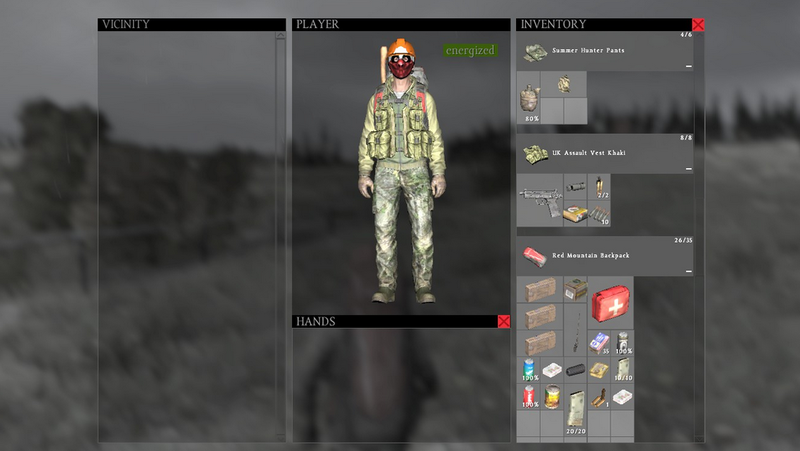 I found some new trousers with a super cool camo look and more inventory slots, I also found a bigger back pack. Seriously! 4 or 5 hours with no packs at all, then 2 within about 20 minutes of each other. I headed a bit further in to the town, and managed to gain some attention from a few zombies, this meant I had to run back out and around again. It’s annoying, but it works. Once back in the the town I came across a supermarket with a few garages outside. I one of these garages was an axe! WOO! Finally something that could actually hurt a zombie, and what perfect timing it was, because as soon as I picked it up, a zombie wandered in to the garage. “Hello, what are you doing?” THONK! Axe to face muthatrucka! he went down like a sack of potatoes. Finally, I could protect myself. I felt good! Almost immediately after taking down one zombie I heard another approaching, I braced myself, and waited for him to come in to view. When he did, I soon realised this was no ordinary zombie, this one was fully kitted out in military attire! Obviously my new found badass-ness had spread quickly in the zombie news and they were reacting to it. He approached me, I stood and waited until he was within chopping distance. Then out of no where, he leapt at me, like some kind of prancing gazelle, it scared the crap out of me. Once I had regained my composure, I quickly dispatched him. 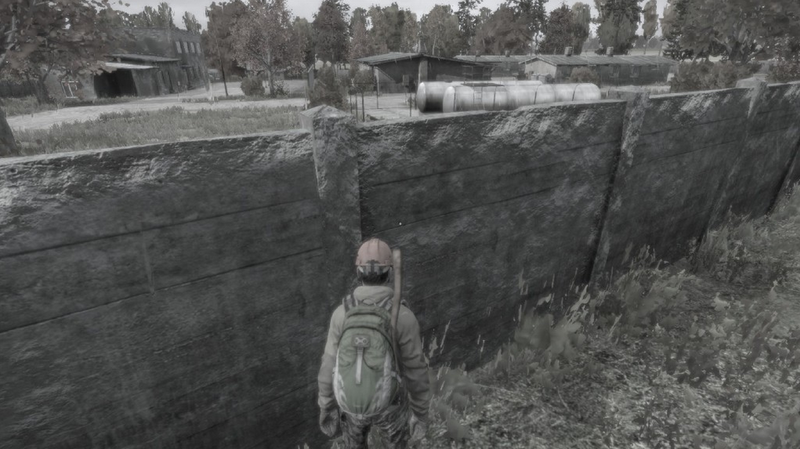 Once done in Stary Sobor, I headed East as there was a military base, and I figured if I was going to find guns, here would be a good place to look. Before entering the grounds, I had a quick search of the perimeter to see if anyone was about. It looked clear, apart from the odd zombie. I quickly got to searching the barracks. These were fresh! I was hoping for to get my hands on an M4, and seeing as it didn’t look like anyone else had been there in a while, I felt I had a good chance, alas it was not to be. I found myself the biggest back pack, plenty of ammo, and a pistol, the FNX45, but I had no magazines, and this time lots of 3 weapon cleaning kits, random… Once I had finished, I started my journey north, where the NW airfield awaited! Even though Hugo is nicely kitted out with lots of supplies, I still felt under prepared, mainly because I couldn’t defend myself from anyone with a gun. Ok, I had the pistol, but without a magazine, it was a good as the spade. Hugo is also still low on blood, (as you can see from my screenshots looking pretty grey), so any major hits could knock me unconscious, or kill me.I had to take things slowly, and keep my eyes very peeled for anyone on the horizon. What would await me at the airfield? Other survivors? Would they be friendly? Hugo is moving in to dangerous territory and his adventure could come to a swift and unforgiving end. Stay tuned to find out what happens.